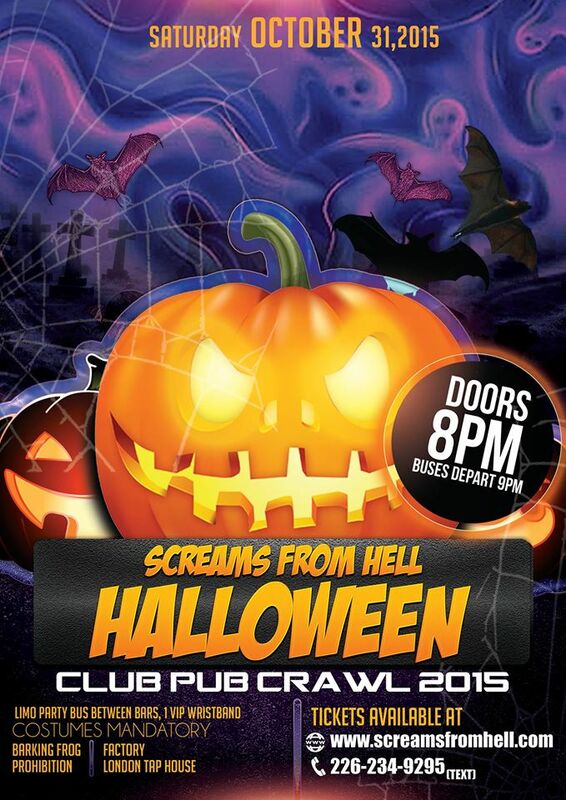 BARKING FROG, PROHIBITION, FACTORY, TAP HOUSE.Start thinking of your Halloween costumes and aboard the 2015 Halloween Club Craw. The spookiest night of the year. Starting at 8pm-3am in downtown London. 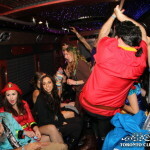 Join thousands of party goers as we club crawl to 4 of London’s hottest venues downtown. Why party at 1 downtown location this Halloween when you can party 3? Advance early bird tickets on sale now Before October 1. Prices will increase. Limited LIMO Buses/Party bus tickets available for this wild party on wheels, don’t delay.How does it work:Easy and simple. Once you purchase your tickets you will receive a VIP Wristband on the day of the event at the starting location between 8pm-9pm. Your wristbands give you no cover/no line between venues during the club crawl. All nightclubs will be walking distances and seconds apart. If you have a VIP general admission VIP ticket their will be a VIP host to lead the way to each location starting at 9pm. 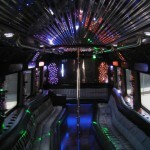 If you have a VIP Limo/Party Bus ticket you will have exclusive VIP party bus transportation between venues starting at 9pm so you won’t be walking anywhere, you’ll be arriving in style at each location. 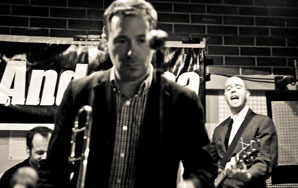 Party at all 3 destinations, or party at the venues you like best. Celebrate Halloween in style at 3 of London’s hottest nightclubs. Lots giveaways & contest at each destination. 9PM BUSES HEADING TO PROHIBITION, FACTORY, TAP HOUSE. $20 ADVANCE TICKETS ON SALE NOW, $25 PARTY BUS TICKETS- TICKETS INCLUDE VIP PARTY BUS & ADMISSION TO EACH VENUE. Start your night at BARKING FROG on October 31st. Present your tickets and receive a VIP Wristband which will give you access to the Halloween Pub Crawl in downtown London. Doors will open at 8pm sharp, wristbands must be picked up before 9pm. Buses depart 9pm. Remember that the venue you pick is where you MUST arrive to. At 9pm the party will continue to PROHIBITION, FACTORY, TAP HOUSE. COSTUMES ARE MANDATORY! BUT HEY, IF YOU DON’T WANT WEAR A COSTUME YOU CAN STILL JOIN IN ON ALL THE FUN THIS HALLOWEEN! Wristbands will be available on the day of the event from the starting location between 8pm-9pm, DOORS 8PM. Wristbands will only be available at the starting location until 9pm. Once you purchase your tickets you will receive an eticket in your inbox from the email you provided. Please remember to print off your eticket and present it to event organizers or you may pull it up from your mobile devices. All tickets purchase online are will call list only which means your tickets are sent to your email. Once you arrive to the starting location, your name will be listed on the event ticket list. For any reason you can?t make it to the starting location to pick up your wristbands, have one of your guests pick them up for you and you can meet them at the destination they arrived to. A- Everyone will meet up at the starting location BARKING FROG (209 JOHN ST)8pm-9pm to receive your VIP Wristbands. 2 starting locations to kick off your Halloween night. Buses depart outside your starting location. A-Yes. Call.TEXT 226-234-9295. All online retailers accept visa debit, paypal, prepaid cards and all major credit cards. A- Each venue will have guest DJ’s and different music vibes. Top 40, EDM, house, r&b, reggae, old school club hits, etc. A- VIP General Admission will follow our VIP Hosts to each destination. All venues are walking distance and few minutes apart. 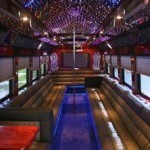 VIP Party bus ticket holders will receive party bus transportation between venues.